Light vegetarian beet soup. Served cold. A satisfying dish with vegetables, lamb, and handmade noodles. Please contact the restaurant for today's availability. The Oldest and Russian Tsar’s favorite dish! Made of rooster, small fishes, crawfish, perch and sturgeon. Served with a shot of vodka, lemon and herbs. One of the festive Armenian dishes. Its cooking and consumption is highly stylized and is enjoyable with good amount of garlic and vodka ! Cooked by boiling bovine shanks for hours until the tendon falls off the bones and the becomes a thick broth. Served with herbs. You will never get drunk while eating khash. Served cold. Russian traditional “summer” soup. Mix of mostly raw vegetables with kvass “bread drink”. Very refreshing and definitely exotic. Served with parsley and sour cream. Old Russian traditional thick soup that contains at least 8 different kinds of meats and sausages. Served with sour cream and lemon. Classical Ukrainian borsch - the most popular soup of Ukrainian cuisine that got its name from the most important ingredient, beets. Served with sour cream, parsley and housemade cheese and garlic pampushki. Freshly made of liver, vegetables and truffle cream. Served with cream and crackers. Pickled vegetables, salo, boiled potatoes, sour cabbage, herring, scallions. Truly a Russian traditional cold appetizer. Served with horseradish and mustard. Finely shredded cabbage that has been fermented by various lactic acid bacteria. It has a distinctive sour flavor and is an extremely healthful food. It is an excellent source of vitamin C, lactobacilli, and other nutrients. Tomatoes, cucumbers, radish, scallions, parsley, dill. Salo is more than a national dish in Ukraine, it is a national philosophy. Salted lard with addition of caraway and garlic. Served with mustard, horseradish, fresh onions and rye bread. Famous Hungarian salami, beef tongue, Russian smoked bacon. Portabella mushroom grilled and stuffed with gorgonzola, salted cucumber, fried onions. Russian Herring-Seliedka. Chilled slices of herring, sliced onions, potatoes with touch of olive oil and fresh dill. Finely shredded beets mixed with prunes, walnuts and salted cucumbers with a touch of garlic. Two egg halves topped with cut butter and red caviar. Authentic Mongolian dish. Large crispy half-moons filled with minced meat filling with herbs. Grilled eggplant slices rolled and stuffed with cheese, mushrooms and tomatoes. Portion of 2. Traditional Russian crepes. Wild mushrooms in sour cream sauce. Baked to perfection. Minced beef/pork filling. Not our homemade pelmeni. Our signature handmade in the house Russian Pelmeni - the heart of Russian cuisine. Made with minced meat filling wrapped in thin dough. Served in herb butter sauce. Your choice of: beef/pork, veal, turkey, lamb, elk, deer, wild boar. Roasted chicken infused with many spices and vegetables in mild tomato sauce over your choice of rice, mashed potatoes, buckwheat, or pasta. Served with fresh vegetable salad. Legendary Soviet dish! Crispy on the outside, juicy on the inside, marinated in garlic and wine sauce and pan fried in its own juices. Served with grilled vegetables, spicy adjika. Our chef's Vladimir signature dish. Served with rice and marinated peppers. Cabbage leaves stuffed with ground beef and pork with rice and herbs. For most children of the Soviet Union, golubtsy evokes memories of comforting meals in a warm kitchen. Served with creamy sauce. Stuffed vegetables is a light and nutritious dish. Bell peppers, zucchini, tomatoes, and eggplants stuffed with ground beef and pork. Served with creamy sauce. Beef Stroganoff won the first prize award in a competition 'L'Art Culinaire' in 1891. Beef, mushrooms, sour cream, and truffle cream. Served with mashed potatoes or buckwheat. Platter of smoked half chicken, salo, pork ribs, and kolbasa. Served with fresh vegetables. Georgian large dumplings with meat and spices. Served with sour cream and adjika. Pork cooked with mushrooms, potato, peppers, zucchini and cheese. Served in a pot. Shashlik (kebab) is a variety of skewered meat. Prepared in our grill using charcoal. Served with grilled vegetables, spicy adjika, marinated onions and herbs. Huge chicken breast breaded cutlet stuffed with apricots, mushrooms, prunes, and walnuts. Marinated ground beef cooked on grill. Served with rice, marinated onions and spicy adjika. Plov is the king of Uzbek cuisine. A hearty one-pot rice dish cooked with lamb, carrots, and onions. Our signature handmade in the house Russian Pelmeni - the heart of Russian cuisine. Made with minced meat filling wrapped in thin dough. Your choice of beef/pork, veal, turkey or lamb. Served in a herb butter sauce. Legendary Soviet dish! Crispy on the outside, juicy on the inside, marinated in garlic and wine sauce pan fried in its own juices. Served with grilled vegetables, spicy adjica sauce and green beans. In sweet and sour sauce. Served with rice and marinated peppers. 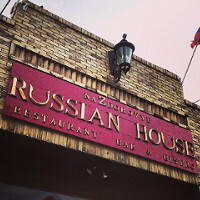 Vladimir's signature dish. Served with rice and marinated peppers. Stuffed vegetables is a light and nutritious dish. Ground beef and pork stuffed with bell peppers, zucchini tomatoes, eggplants. Served with sour cream sauce and asparagus. Beef Stroganoff won the first prize award in a competition, 'L'Art Culinaire' in 1891. Beef, mushrooms, sour cream and truffle cream. Served with mushed potatoes or buckwheat. Azu is a combination of beef, sauteed vegetables and sliced pickles. Served with buckwheat or fried potatoes. Stuffed with seafood cocktail in a creamy sauce. Served with fresh vegetable salad and green beans. Mussels in a creamy wine sauce. Served with croutons. Smoked shark. Served on skewers with grilled vegetables. Smoked sturgeon. Served on skewers with grilled vegetables. Smoked salmon. Served on skewers with grilled vegetables. With garlic and cheese cooked in olive oil. Oven baked potatoes with basil, garlic, and cheese. Please contact the restaurant for today's tea selection and include in Special Instructions. Kvas can be considered a national Russian drink along with honey beverages. The first record of kvas dates back to 989, remarkable as the year when the Kiev Prince Vladimir converted his homage to Christianity. The chronicle reports on this as follows: “To hand out food, myod and kvas to the folk”. Kvas was used in banyas (bath-houses) to increase the vapour, whereas sour kvass was poured over oneself for better health. Russian traditional refreshing drink prepared on the basis of berries. A light refreshing drink made by boiling fresh or dried fruits. Served chilled and infused. Layers of caramelized pumpkin, cookie, pistachio nuts, and pistachio ice cream. Layers of vodka infused fruits with vanilla ice cream. A common Middle Eastern crumbly dessert based on sunflower nut butter and sugar. Chocolate covered candy filled with soft milk souffle. Cold coffee with ice cream. Layers of blini with white and chocolate cream. Two mini cheesecakes of your choice: vanilla, hazelnut, chocolate, condensed milk covered in chocolate. The owner's family recipe. Rich hard chocolate fudge with walnuts and biscuits. Oven baked apple filled with cottage cheese, honey, pecans, and prunes. Your choice of: fruit jam, Nutella, honey, condensed milk, or peanut butter.